“Banzai!, Banzai Nippon!” Benjamin Agaloos vividly recalls that salutation to what became the enemy when the Japanese Imperial Forces marched into Manila on the second day of the dark year of 1942. Over weeks earlier, on December 8, 1941 Manila folks had fallen silent, including the Agaloos family of Abreu Street in San Miguel district, as they heard the explosions from distant Clark Field in Pampanga. It was a day of faith and fate. The 1941 feast of La Inmaculada Concepcion also became the day of defilement of the pueblo amante de Maria (Mary’s beloved country). The explosions on that day seemingly embodied both he sacred and the profane. There was no holding back on the traditional outburst of celebration at the Basilica of the Immaculate Conception (Manila Cathedral) in honor of the Feast of the Virgin Mother. Two days later, on December 10, 1941, horrific blasts rent the Noble and Ever Loyal City of Manila. Both banks of the Pasig River and the docks at Port Area were soon littered with the burning steel carcasses of transport freighters, commercial ships and other naval vessels destroyed by Japanese bombers. The Japanese Christians had anchored on the shores of Manila in 1614, and eventually settled in San Miguel, which district welcomed them in brotherly embrace. They included two gentlemen who had been influential in the Shogunate court—daimyo Takayama and daimyo Nayto. With them were former bhikunnis or Buddhist nuns, who would comprise the first order of Catholic nuns in the Philippines, later to be known as he Beatas of Miyako after their place of origin in Japan, and who would establish the Colegio de Señores Recogidas. The area known as the original San Miguel, which became San Miguel Viejo, lay south of the Pasig River, beside the area called Dilao where another Japanese community took root. San Miguel district as it is known today—north of the river—came about only after the British occupation of Manila in 1762. The transfer of the district resolved a conflict between the Jesuits and Franciscans who had been at loggerheads over the care of the Japanese Christians By virtue of a papal bull, they fell within the Jesuit mission, but the Japanese of both Dilao (Paco) and san Miguel were under the jurisdiction of the Franciscans. In a 1603 royal decree, Philip III instructed the insular authorities to give San Miguel exclusively to the Jesuits. A separation was effected. However, not until after the British occupation would the present site of San Miguel, opposite the banks of the Arroceros, come into existence. 1942 thus marked the return of the sons of those early Christian refugees to their Philippine ghetto, only this time they were coming a conquerors, even while claiming o be brothers in the spirit of cooperation under the Greater East Asia Sphere. Every household in Manila had been instructed to construct shelters, bunkers and foxholes as places of retreat in the event of a Japanese blitz, despite the declaration of Manila as an Open City on December 26, 1941. In contrast to the festive landing of the Japanese in 1614, the mood in the city became somber. Benjamin Agaloos was then only six years old. But he remembers how “Banzai! Banzai Nippon!” was laced with no small amount of derision when the populace was made to hail the enemy. The cries were uttered with an undertone of protest. Nobody among the current employees of Tanduay Distillery is more familiar with its location an premises than Benjamin Agaloos. As a young boy, he used to play with his friends on the same street where the distillery still stands to this day. All the other distilleries and breweries in Manila had eventually relocated outside the district. These included La Fabrica de Cerveza de San Miguel, founded by Enrique Maria Baretto de Ycaza; La Tondeña Incorporada, formerly of the Palanca clan, Distilerias Ayala Incorporada, which originally manufactured Ginebra San Miguel; and Distileria Limtuaco of Binondo founded by Bonifacio Limtuaco. Only Tanduay Distillery remains in its original site that used to be called Isla de Tanduay—the place that lent the company its name. What became Tanduay Street runs from Plaza del Carmen to Aviles St. where Malacañang stands. It was “pistaym” (peacetime) still, when according to Mang Ben, Tanduay products were still transported on cascos from Isla de Tanduay to Muelle de la Industria downriver, where the head office of the Elizalde y Cia was located. But even then water lilies teemed in the waters of the Pasig. When the war came, those lowly water lilies became a vital staple at every dining table. A respectable menu for wartime residents consisted of castaniyog—fried stale coconut meat ingenuously converted to food—and “sisid” rice that was harvested by diving off the North Harbor for the sacks of rice in sunken transport ships. 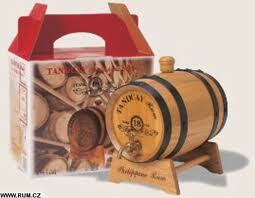 All throughout the Japanese Occupation, Tanduay stood for resistance. Anticipating the Japanese need for alcohol fuel, General Douglas McArthur had made a preemptive decision and ordered the closure of all alcohol distilleries in Manila. True enough, the Japanese Imperial Forces occupied the Tanduay Distillery compound with the intention of converting it into an alcohol fuel factory. The company had to occupy the Adamson University compound after its eviction from Tanduay Street, says chief chemist Faustino Munarriz, who was then a chemistry student at Adamson. 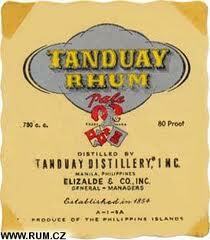 Tanduay Distillery continued to employ Filipino workers and operate despite the Japanese presence. In 1943, Juan Miguel Elizalde was arrested by the Kempei Tai in his head office at 345 Muelle de la Industria in Binondo, on charges of collaboration with the guerilla forces. His brother Manuel (Manolo) Elizalde was, at the time of Juan Miguel’s arrest, already languishing in Fort Santiago, together with Jovito Salonga, Tomas Morato, Sr., Raul Manglapus, Eulogio Rodriguez, Sr. and Elpidio Quirino, among others. Both Juan Miguel and Manolo were tortured in the Fort Santiago dungeons. In the United States, their brother Joaquin, resident commissioner of the Philippines from September 29, 1938 to August 9, 1944, as part of the exiled government of Manuel Luis Quezon, continued to lobby for the immediate liberation of the Philippines. The other brothers Angel and the symphony orchestra conductor Federico were also guerrilleros. To save Manolo from the Japanese, Juan Miguel admitted to all of the charges against him while affirming the innocence of his brother. Juan Miguel died in captivity, while Manolo was released owing to his tuberculosis and through the intervention of a friend who was to become a congressman, Pio Duran. Upon his release from prison, Manolo quickly rejoined the resistance forces. Upon Manila’s liberation in 1945, American servicemen queued up from the expendio of the original Tanduay compound, in front of what is now Ramon Avanceña High School, up to Plaza del Carmen in the vicinity of San Sebastian Church. The first cases of rum bought during Liberation were procured by U.S. military personnel, according to Mang Ben. Two years after Liberation, in 1947, all of the Elizalde business went back to normal operations. Since 1953 up to the present, Mang Ben has been at work with Tanduay Distillery. That Philippine Liberation was celebrated with Tanduay can only be deemed appropriate, for Tanduay continues to embody the Filipino and his history—from slump to recovery, from war to peace, from hardships to festivities.